Once upon a time, the corporate learning environment was bursting with boring presentations filled with too many words, occupying too many slides. Soft skills are key to effectiveness in life. From self-confidence to communication skills and emotional intelligence, they all play a significant role. Social learning remains one of the most misunderstood components of modern workplace learning strategy. A change in mindset is necessary. 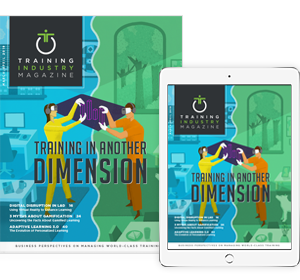 This edition of our magazine explores a menu of delivery approaches that can improve the impact of many learning and development programs. From an early age, storytelling has played an important part in our personal development. Think back to your childhood. “Space” is no longer a barrier for (L&D) departments as they develop and implement creative solutions designed to meet the needs of remote and distributed workforces. Because when people think of tools, they have long been conditioned to think of devices or equipment -- the tangible things you can employ to accomplish a task. Learning professionals are facing a crisis that is not being addressed sufficiently. Workplaces are all too frequently toxic, and as a result, the learner is not prepared to learn. A whopping 13 percent of employees worldwide are engaged in their jobs. There are a multitude of reasons why employees are not engaged. As millennials now represent more than 50 percent of the workforce and Generation Z begins to enter it, personal, engaging and relevant new hire onboarding programs are important. Companies invest a lot of time and money measuring customer satisfaction. These measures usually assume the form of a survey.